Dogs and humans in the background (after the pope). 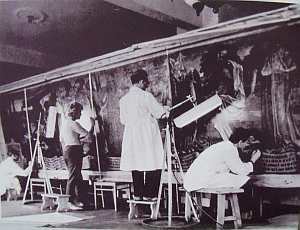 The painting was restored in 1962-1964 in Moscow. As the photo above shows, this was about time - in particular, the small piece of canvas with the king, was in a very bad condition. During an earlier restoration in 1843, the two canvases had been glued upon a larger canvas. During this process it had apparently been necessary to cut 15 gashes in the canvas in order to smoothen out the wrinkles. Therefore a part of the restoration consisted of mending those 15 cuts along with 358(!) other holes of various sizes. The dance of death being restored. After this, centuries of dirt and paint were removed. Originally the dark and gloomy colours had been taken as a proof of Bernt Notke's twisted mental life, but as the dark varnish was removed, the colours became brighter and plants, humans, dogs and grazing deer began to appear in the background. Is the painting an independent work or just a copy of the painting in Lübeck? Using X-rays one could see the original sketches below the paint and these often diverged from the finished painting. For instance the letters below the preacher were originally placed much higher up. These changes from the original drafts indicate that the painting is an independent work. 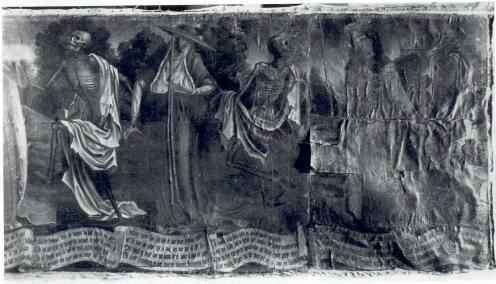 The dance of death in Tallinn after the restoration. As an added bonus an old misreading was corrected: The second line had been read as »Seet hyr dat spectel« (= "see here the spectacle"). It turned out that the word was not "spectel", but "spegel". The dance of death is not a play, but rather a mirror. The restoration also supplied the final proof against the silly claim that the fragment in Tallinn should be a remnant of Lübeck's original painting from 1463 - that had been cut out in 1588. Erik Moltke: Bernt Notke's Altertavle i Århus Domkirke og Tallinntavlen (Danish book with chapter summaries and captions in German). Photos of the painting in St. Mary's Church in Lübeck. Photos of the fragment in St. Nicholas' Church in Tallinn. Bernt Notke - the original painter (maybe). 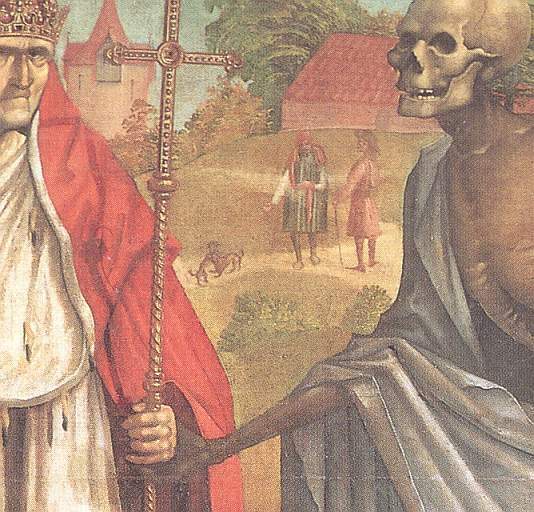 Did Bernt Notke paint the dance(s) of death? 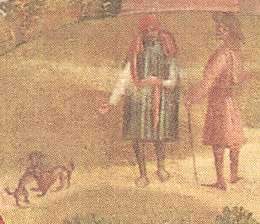 How close a copy was the painting from 1701 of the painting from 1463?